I sometimes think we have almost as many adventures getting to a race as we do actually taking part in the race - Stratford was no exception. 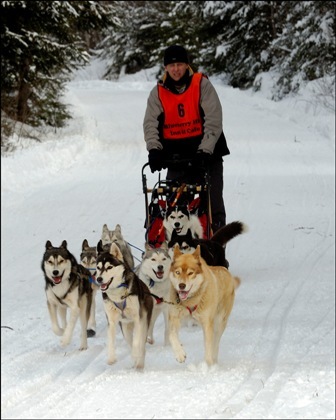 Put on by the North Country Mushers and fully supported by the Stratford Nighthawks Snowmobile Club, the Stratford race takes place in eastern Vermont on the edge of the White Mountains; a mere two provinces and three states away. Vermont by 0100 on Saturday morning - plenty of time to catch a nap before the race. In fact once on the road all was going well until hunger/greed took over and I decided to stop for some food at around 2000 well into the US but still not yet past Bangor. Having grabbed a quick burger, and having refueled the van, the guy behind the counter at the gas station pointed out that it had started to snow and the signs looked ominous. I looked out of the window at a few flakes fluttering down and dismissed it in my own mind as a minor flurry at best/worst. Besides the roads were good and clear - what was there possibly to worry about? And I was right of course, as long as I stayed on the Interstate, and provided the snow remained as a minor squall there truly was nothing to worry about. Five minutes later I turned off the Interstate onto Highway 2 in order to cut west across Maine and drove straight into a blizzard. began to sweep over me; I decided I had better find somewhere to stop. Endowed with Shylock like qualities I was loathed to pull into a hotel or motel at this time of night and pay exhorbitant fees for what would be just a couple of hours sleep. Besides which we were becoming masters of sleeping in the van by the side of the road, I had even worked out a body contortion technique that almost allowed me to crawl into the van's heating duct to extract that last little bit of heat from the idling engine. All I needed to do was find some lay by to stop in for a few hours. eating into too much of his allowance. The ne'er-do-well threw me a glance and then continued to try to convince the receptionist that he had a special arrangement with the motel's owner thus securing cheap rates on a Friday night. By now I was truly exhausted, had god knows how many miles still to travel and a 30 mile race to take part in in just over 6 hours - I needed to get to bed. As the receptionist finished cursing at the computer the young lout looked past me and out into the car park at our UK assembled van. "Is the steering wheel on the wrong side?" - I sighed in the affirmative too tired to argue that I was in fact quite happy with its current location. "You'll not be from round here then?" - I responded in the negative. "Where are you from then?" "Canada" - a mere half truth and easier than a full explanation/geography lesson - it was too late for that. "I am dog sledding" - I prepared myself for the usual questions. "Stratford. Do you know if I have much further to travel?" "Dog sledding, wow." And then he paused for just a bit too long "I used to dog sled" he quite patently lied whilst still ignoring my question. "I took part in the Junior Iditarod one year"
"Oh yea, I was third"
muppet), his nose would at that point have been entering New Hampshire under its own volition. I feigned interest and nodded my head hoping his attention span was not that good and he would soon lose his chain of thought and leave me alone. Fortunately before he could push back the boundaries of credibility or reality any further the receptionist's computer burst back into life. "OK your room is booked, come back and see the owner in the morning to settle your bill"
had come in to it. Once the receptionist and I had collectively established that rooms were still available (and at military rates - I am after all a miser to the core), that the car park was secure and secluded and that I had no intention of bringing any dogs into my room (there is undoubtedly a motel joke there but I reserve the right not to pursue it) I enquired as to whether or not the receptionist knew where Stratford was. "Sorry I don't, this is my first night on the job". "Oh yes, lived here all my life but only started this job tonight"
"O...K... Do you happen to know where Berlin is?" This was the town where I would turn off the Highway to cross the mountains and judging by the distance I had already traveled I knew it couldn't be too much further. She didn't know this either - a not very local local. expensive if albeit Spartan room with the aim of getting at least two hours sleep. determined to get some value out of this room even if it was just wasting the complimentary soap, shampoo and shower cap and using as many towels as possible - it was too late at night/early in the morning to explore my conservationalist tendencies) and wandered back into reception to await the owner. Eventually after some delays the bill was settled and after a mere two hours respite I was back on the road. By this time the previous night's storm had all but subsided and the road had, at least in part, been ploughed. As we climbed up into the White Mountains, and I was as ever overcome by the magnificence and splendour of the views, I began to relax somewhat, even daring to consider that I might make the race start on time - did I mention above that I do have a propensity for naivety? As I approached Berlin I studied the map closely, or at least as closely as you can whilst eating a bagel, drinking an extra large coffee (let the gods bless Dunkin' Donuts) and attempting to drive a van in snow and on the wrong side of the road. As I studied the map it became clear that my choices were either to remain on the Highway and take the slightly longer, but obviously clearer (and much more sensible) route or turn off in Berlin and follow a side road up and over the mountains. My head said stay on the highway, it'll be quicker, my heart said stay on the highway, there'll be less chance of getting stuck in the snow, my common sense said stay on the highway there'll be a better chance of surviving. I do wonder why it was then that as soon as I reached Berlin I pulled immediately off the highway, onto the side road and straight into a series of diversions caused by road closures as a result of all the snow. I ended up, after a great deal of swearing, on a minor road that had been barely cleared on snow and not at all sure that I was heading in the right direction. Eventually however after a great deal more swearing interspersed with a degree of praying and not an insignificant amount of good luck I pulled into the race site a mere twenty minutes after the scheduled start of the musher's meeting. There is one thing our 'Euro-van' does with more monotonous regularity that it does breaking down (and it does that a lot) and that is getting stuck; mud, ice, snow, grass. I swear that if you look at the van the wrong way she will spin her wheels in protest. With this in mind it was with some trepidation that as I pulled into the race site I stopped next to the hailing official (she was obviously official, she had a clip board) on a snow covered yet seemingly icy incline. "You must be Rob, do you think your truck will make it up the hill into the parking lot?" enquired Rhonda. "Oh, OK. Just turn around then and park just over there next to the trail." As it turned out my parking spot had a major(ish) advantage and several major disadvantages. 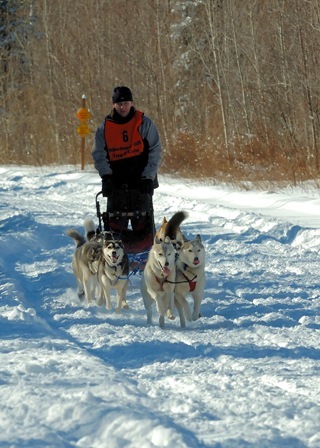 The advantage was that I was within 60 feet of the starting line; I could get the dogs out of the van, snack, harness and hook up and then had clear trail ahead of me into the starting chute and so could pull the snub at the van and make a virtually unhindered start. teams that had to mush past my van to the finish (did I mention that my parking spot was actually part of the race trail) and found their dogs distracted by something interesting in or around the van then perhaps my site wasn't a preferred location; needless to say this prime piece of real estate was denied me the next day. Anyway after such a painful and exhausting journey just to get to the race site it would be nice to report that the rest of the weekend was a breeze with the dogs running the perfect race, flying around the 30 mile course in record time. Alas, as usual, it was not to be. running less dogs is embarrassing in the extreme. Cal to replace Paris; now I was running with a new and completely untested leader combination. Still they ran together, of sorts, and despite the fact that we reverted to running on the left hand side of the trail (Fya's Scottish roots and English driving license taking full charge) we finally made it back to the finish line. As we all stood around listening to me moaning about my run (another common occurrence I must add) I learnt that others had suffered too. Becki (Tucker) had gone through the same doubts about the futility or otherwise of our chosen hobby. I think there must be some solidarity in misery (I am after all a Wolverhampton Wanders supporter so have studied and been subjected to misery ad infinitum) and as such I decided that after a good night's sleep (and possibly a few carefully quaffed ales) the whole world of mushing would look different, better dare I even venture to say. And so after an evening of excellent conversation, shared with good friends, and having eaten extremely well courtesy of the Stratford Nighthawk's Snowmobile Club, I retired to bed to catch up on some much needed sleep - tomorrow could only be a better day!! 3. Cal, his cage companion for the evening, was pressed as far as possible into the opposite corner of the cage doing his damnedest to put as much distance as possible between himself and what obviously emanated from Fya. This was an unmitigated disaster. Despite the fact that I am always loathed to admit this in front of 'mummy', Fya is probably just about our best and most consistent sled dog; not in anyway a leader he is otherwise the complete package. Since he was just a puppy his drive and motivation have been so impressive (if only we had known then what we were doing ... if only we knew what we were doing) and even now as he pushes towards veteran status and is surrounded by younger and much more exuberant dogs he is still #1 pick on the team. However in all the years of running him I had never seen him like this and had never had to contemplate doing a race, or even just a run, without him. perhaps just a one off bug. As my start time was still over two hours away he could well be fully recovered, rehydrated and ready to run by then; I am nothing if not naive, stupid, optimistic. up the other seven dogs but left Fya, for the first time in our seven year mushing relationship, in a cage on his own whilst the rest of us went out for a run. I don't think I have seen a dog, and certainly not Fya, go quite so mental when he realised he was not coming along for the ride; he pawed at the cage door, howled at the top of his voice and caused the van to rock from side to side as he charged around his cage. For a brief second I figured that for a dog to act in this manner then he must be fit to run, I reversed my decision and turned back to the van to very quickly get Fya harnessed. Thankfully however common-sense punched me smack on the nose - there was no way he was fit to run and I was a fool for even contemplating it. 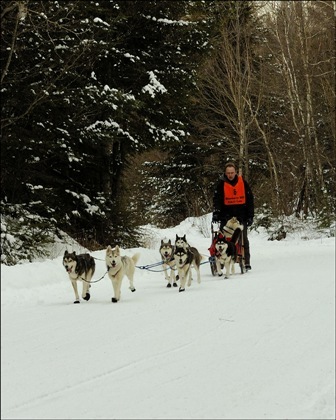 I sighed as I turned back to the sled to set out on another adventure but this time without a constant companion; with Fya's howling haunting me, I took the team down to the start line for day two of the race. lesson learnt, Medea needs to be booted! We made it up the side of the mountain without the soul searching that had impeded our progress the day before but as we rounded the summit I realised I had one more valuable lesson to learn and one more new task to undertake before the finish. wrong I should boot her too. As I lifted up her front right leg though in order to fit the boot she gave out a pitiful cry. Realising then that there was a more serious problem I did something that I had never had to do before in nine years of 'mushing' - I 'bagged' a dog. 2. I had never 'bagged' a dog before on sled, ATV or wheeled rig. I therefore did not understand the ensuing sled dynamics. 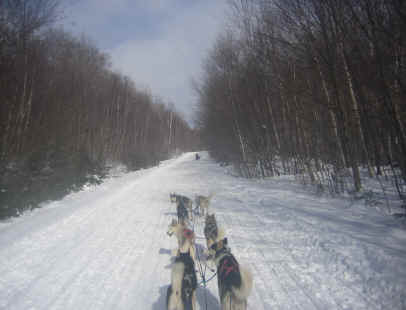 dropped away to the right, so did the sled... and the musher...and Poppy. How I did not land on top of her as I elegantly flipped the sled and careened into the trail I do not know. Determined not to expose myself further for the inexperienced oaf that I am I barrel rolled (of sorts), managed for a second time to avoid flattening Poppy and whilst still holding on to the sled hauled myself to my feet before anyone could see what a complete arse I was/am. The musher immediately behind me glided passed unhindered and (outwardly at least) unamused by my Jerry Lewis On Ice performance; she eased off towards the finish line without comment. class there was one musher who took longer than us to get round. The end of another (long (!!) and boring) adventure? I guess so. We drove and drove and drove in order to get home on Sunday night/Monday morning so I could be up bright and fresh for work on ...Monday morning. I stopped once to feed the dogs and then once to clean up the diarrhea from Fya's cage because the idiot driver fed him by mistake as well. Are we stupid driving all these miles to 'race'? Probably but who really knows? Will our performances ever get better? I have to honestly say - Probably but who really cares? Are we having fun? You'd better believe it!? !